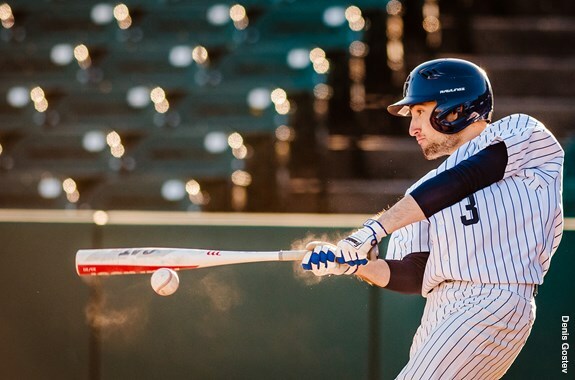 It was a very good weekend for Baruch College’s men’s spring sports, as the baseball and volleyball teams finished with winning records. Men’s volleyball continued its great season with two wins in the Baruch Tri-Match on the weekend of March 30. The tri-match featured Bard College, Misericordia University and, of course, Baruch as the host. The first match came against the Bard Raptors. It was a clean sweep for Baruch, winning all three sets 25-21, 25-6 and 25-13. The CUNYAC Men’s Volleyball Player of the Week, Artem Zinkin, led the team once again with nine kills. Sophomore Meni Musheyev had himself a solid all-around day with seven kills, four aces and three blocks, while Stallone Shankar finished with a team-leading 18 assists. After the match between Bard and Misericordia, which resulted in a Misericordia Cougars sweep, the Bearcats once again displayed their dominance against the Cougars. The team once again swept its opponent by scores of 25-23, 25-13 and 25-19. Nicholas Godino led with 16 kills, and Shankar once again led with 18 assists. Sophomore Evan Takos added six blocks to the victory and Kyriakos Semertzidis had 12 digs. With these two victories, the Bearcats improved their overall record to 14-12, as of March 30. Their CUNYAC record still sits at 3-3, after their loss to Hunter College. They are set to face off in their final CUNY and regular match when they face the Brooklyn College Bulldogs. On Saturday, the Bearcats hosted the Lehman College Lightning at MCU Park. Notorious for traffic jams and wind, MCU Park failed to give itself a name beyond its reputation this game. The wind blew in from center and aggressively gusted over at 15 mph throughout the afternoon. It was so demanding that both outfields played a third of the way to the warning track. Despite a 50-degree forecast, the wind shear had the feel of around 40 degrees Fahrenheit. For reference, the coldest opening day in Major League Baseball during the last decade was 39 degrees Fahrenheit. In the first game, starting pitcher Theodore Avgerinos was dominant. He pitched the entire game, while striking out six. Avgerinos effectively mixed up the rhythm of his windup while hitting his spots. The execution was very solid. The infield was acrobatic. Third baseman Liam O’Gara showed off his range and his strong arm throughout the doubleheader, regularly firing the ball across the diamond. Shortstop Nicholas Valeriano kept his chest square to his target, while contorting his midsection to generate strong and accurate throws. After quick chats with some of the players after the game, they agreed that the wind was the biggest factor condition-wise. The heads-up moment of the day was when center fielder Namir Garcia got his team out of a lead- threatening fourth inning. He pump-faked a throw to the cutoff man, effectively setting a backdoor trap for the runner at second base. In the second game, the Bearcats capitalized off their momentum. Despite being down a run in the first inning, they stormed back in their half of the inning to retain the lead. The lead wasn’t relinquished for the rest of the day. They took advantage of weak pitching and drew five walks in the game. First baseman Connor McCabe sparked the team when he mashed a triple well over the outfielders’ heads. Three pitchers and 10 hits later, the Bearcats were visibly fired up. Starting pitcher Hasan Deljanin dodged trouble throughout his 4.1 innings of work. Despite giving up hits early in his innings, his ability to mix up the Lightnings’ timing from the stretch allowed him to strand six runners on base. Two of his three strikeouts came with runners on base. Late into the afternoon, fire and fun mixed well. At one point, a player ran a 300-foot slant route all the way into the bullpen. A teammate fired him a pass, and a nearby pitcher hit the ground like he was taking cover from an artillery strike. The Bearcats look to carry their momentum throughout the rest of the season, but their coming matches will tell whether they'll be able to do so.